Of the eight major leaguers1 who were prisoners of war in World War II, only one also played in a World Series. He was Mickey Grasso, who played in four September games for the 1954 Indians and was behind the plate in the tenth inning of World Series Game One when Dusty Rhodes hit a walk-off home run. Newton Michael Grasso was born on May 10, 1920, in Newark, New Jersey. His parents, Carmen and Lena Grasso, had emigrated from Italy to settle in Newark. The 1930 US Census lists an older brother, Michael, and a younger brother, Bernard. Newton was an outstanding ballplayer in grade school and on the sandlots of Newark; as a fifth-grader, he was good enough to sub on the eighth-grade team. He was later voted All-City catcher in the grade-school category. Newton was a pitcher in high school, where his talent was recognized by Newark Bears general manager George Weiss, who recommended a move off the mound. A tryout with the Trenton (New Jersey) Senators of the Class B Interstate League was arranged by Newton’s uncle Bob Ciasco; the club was managed by former Washington Senators great Goose Goslin. On April 7, 1941, among a crowd of 200 eager prospects, Grasso showed enough potential to warrant his first professional contract. Goslin signed the newcomer and planned to use him at second base; however an injury to the regular catcher necessitated a move behind the plate. The right-handed hitting Grasso stood 6-feet tall and weighed in at 190 pounds. Teammates nicknamed him Mickey, after noticing a resemblance to Hall of Fame catcher Mickey Cochrane. The prisoners were flown to Italy and transported by rail to Furstenberg, Germany, where they settled into Stalag 111B. Mickey was held captive along with 6,000 others for two years, three months and ten days. In the early part of the war, German prison camps were run in the same efficient manner as the German army. Captured soldiers were systematically sent to camps based on branch of service. Once interned, the prisoners were separated according to rank. The prison camps varied in size; all were equipped with a parade ground, where prisoners gathered twice a day to be counted. The United States and Germany had signed on to the Geneva Convention, which stipulated proper conduct toward prisoners of war. The Germans adhered to the code and generally treated those captured in accordance with the rules and regulations. Exercise and recreation was encouraged and the parade area was generally ample size for games of baseball or softball. POWs had access to sports equipment provided through the Red Cross. Massive numbers of gloves, bats, and balls were collected in the United States and shipped overseas, ultimately arriving at prison camps. Mickey and his prison mates at Stalag 111B made frequent use of the equipment. Prisoners felt it was their duty to escape. Grasso was involved in three failed attempts, each warranting a brutal beating at the hands of the guards. He finally managed to escape on April 20, 1945, about two weeks before the Germans surrendered. The Russian army was closing in on German forces near the camp. Grasso’s captors ordered prisoners moved farther from the ground fighting. By this time, the German army was short of personnel and most guards were poorly trained older men. On the evening on the evacuation, Mickey was one of ten prisoners who simply ran off while the guards snoozed. The escapees marched through towns, led by a prisoner fluent in German. When stopped by German officers, the leader said it was a work detail; the explanation seemed plausible and the trip resumed. Happening upon a dilapidated boat, the group climbed aboard and paddled across the Elbe River to the safety of the American side, where they were met by American forces. It took some convincing, but finally the American soldiers, with rifles drawn, believed the interlopers were prison camp refugees. After being liberated, Grasso weighed 60 pounds below his normal playing weight and the repeated beatings at the hands of camp guards left him frail. Acclimating to peacetime, he returned to Trenton and started the long climb through the minor leagues, hoping to once again become a prospect. His compensation as a POW amounted to $1,195, or almost a dollar a day. In 1946, after a brief trial with the New York Giants, Grasso was assigned to their Jersey City farm team, hitting .228 with 13 home runs in 106 games. He became Jersey City’s regular catcher in 1947, posting a .268 average with 16 home runs. After the season he was sold to the Pacific Coast League Seattle Rainiers for the then staggering sum of $20,000. At Seattle in 1948, Grasso could proudly boast of having a 5,000-member fan club. He commented that he “made 1,000 friends by giving away 1,000 baseballs that belonged to the club.” Behind the plate, he led league catchers with 81 assists, while batting .261 with five home runs. Settling in with Washington in 1950, Grasso shared the catching duties with Al Evans. He played in 75 games and hit a career-high .287. One day the hot-tempered catcher was ejected for contesting a call by umpire Ira Gordon. Mickey flung his mask into the air, strategically flipping it far enough to miss the man in blue. After Gordon ordered the catcher to the sidelines, Grasso began unhitching his shinguards, slowly flinging each into the air. The second landed on the umpire’s head, resulting in a $200 fine. In 1951 Grasso split time behind the plate with Clyde Kluttz. He played in 52 games, and his hitting slumped to .206. In Boston on May 14, 1952, before a Senators game with the Red Sox, Grasso was honored by the American Prisoners of War Association. The slightly embarrassed Grasso slowly sauntered to home plate and received a lifetime membership in the organization. Fiery as he was, Grasso didn’t actually get tossed from a major-league game until a July 3, 1952, doubleheader in Washington against the Yankees. Trouble brewed in the first game when New York right-hander Tom Morgan clipped Mickey on the hand with an inside pitch. Later a fan interfered with a foul popup that would have been an easy play for Mickey. In the nightcap he poked a base hit, then was called out trying to reach third base on another hit. After a long and loud protest, Grasso was thrown out by umpire Larry Napp. Grasso lost his starting job in 1953. On May 10, while conversing in the dining car of the train taking the team home from Philadelphia, the players started discussing league opponents. Mickey remarked how Pirates third-string catcher Ed Fitzgerald had impressed him since their days in the Pacific Coast League. Apparently Bucky Harris agreed, and three days later Washington plucked Fitzgerald off the waiver list. On May 19 Grasso suffered a split finger and the newcomer was pressed into action. Fitzgerald hit a robust .350 and stayed in the lineup, even after Mickey healed. The 1953 season ended with Grasso batting only .209 in 61 games; on the last day of the season he was instrumental in helping teammate Mickey Vernon clinch the American League batting title. The Senators first baseman was leading rival Al Rosen of the Indians, .337 to .336. In the eighth inning, the first three Nats hitters collaborated to go down in order and not give Vernon another trip to the plate. Grasso led off with a clean double, but “wandered” off second for the first out. Keith Thomas was out stretching a single into a double. Eddie Yost reached for a pitch out of the strike zone and popped up. Grasso came to terms with Indians GM Hank Greenberg during a long phone conversation. Cleveland restored his salary to $14,000 and Mickey was delighted at how Greenberg even paid for the long-distance call. 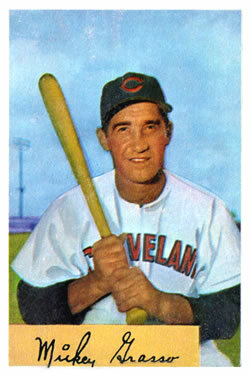 The 1954 Indians, managed by Al Lopez, sought a capable receiver to back up star catcher Jim Hegan. On March 24, during an exhibition game against the Chicago Cubs at their Mesa training center, Grasso broke his left ankle sliding into second base. The ball had been hit to shortstop Ernie Banks; Grasso thought Banks would step on second for the force, but Banks fielded the ball and threw to first, making the slide unnecessary. The Indians won the spring contest 12-2, but lost their backup catcher. Hampered by the ankle injury, Grasso ended up catching only the four September games, hitting a single and a home run in six at-bats. In Game One of the World Series against the Giants, Jim Hegan was taken out for a pinch-hitter in the top of the tenth inning. In the bottom of the inning Grasso replaced Hegan and was behind the plate when Willie Mays stole second base, setting the stage for the game-ending pinch home run by Dusty Rhodes. The Giants went on to sweep the Indians. Bob Lemon gave up Rhodes’s home run, and Giants’ coach Chuck Dressen later said Mays’ stolen base was due to Lemon not holding him on first. Demoted to the minors by the Indians after the season, Grasso was drafted by the Giants, the organization where he started. Manager Leo Durocher remembered Mickey from the previous spring, when the Giants and Indians toured together, and coveted his aggressive play. But Mickey was released after appearing in only eight games, with no hits in three at-bats. Grasso made minor-league stops at Indianapolis, Miami, and Chattanooga before calling it a career after the 1958 season. His big-league tenure spanned parts of seven seasons; he posted a lifetime batting average of .226. In retirement, Grasso ran several successful restaurants and also worked in the horse-racing industry. He married in July of 1959 and a daughter arrived in October 1961. He died of a heart attack on October 15, 1975, in Miami. 1. Gary Bedingfield, Behind the Wire: Baseball Players Who Were POWs in World War II. www.baseballinwartime.com/pow.htm. 2. Burton Hawkins, The Sporting News, March 11, 1953. 3. Shirley Povich, Washington Post, March 20, 1950. 4. Shirley Povich, Washington Post, January 22, 1954. 5. Bob Addie, Washington Post, February 25, 1961. 6. Bob Addie, Washington Post, January 12, 1962. 7. Shirley Povich, Washington Post, March 2, 1953. 8. Herb Heft, Washington Post, August 30, 1953. 9. Shirley Povich, Washington Post, January 22, 1954. 11. Herb Heft, The Sporting News, February 10, 1954. 12. Bob Addie, Washington Post, April 11, 1954.